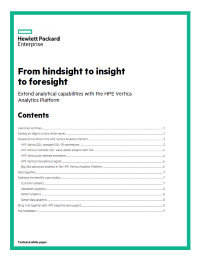 Download this white paper to be familiarized with real-world applications of the HPE Vertica Analytics Platform. Companies should keep on eye on the bigger picture when choosing a Big Data analytics software to push the right information at the right time into their organizations. The HPE Vertica Analytics Platform uses its built-in capabilities to develop your own next-generation Big Data analytics functions.